Along with the à la carte menu, Gillray’s also serves an Autumn Market Menu which was really reasonably priced at £20 for two courses and £29 for three courses (and includes a cocktail of the bartender’s choice after dinner). The options on this menu were more limited, but what was offered sounded really good. We therefore mixed it up, ordering from both the a la carte and the Autumn Market menus (the squid, duck and brownie are all from the latter). Pan-fried scallops with braised salsify, rhubarb and blood orange (£11.50) was pleasant with the sweet acidity from the fruits pairing well with the scallops. 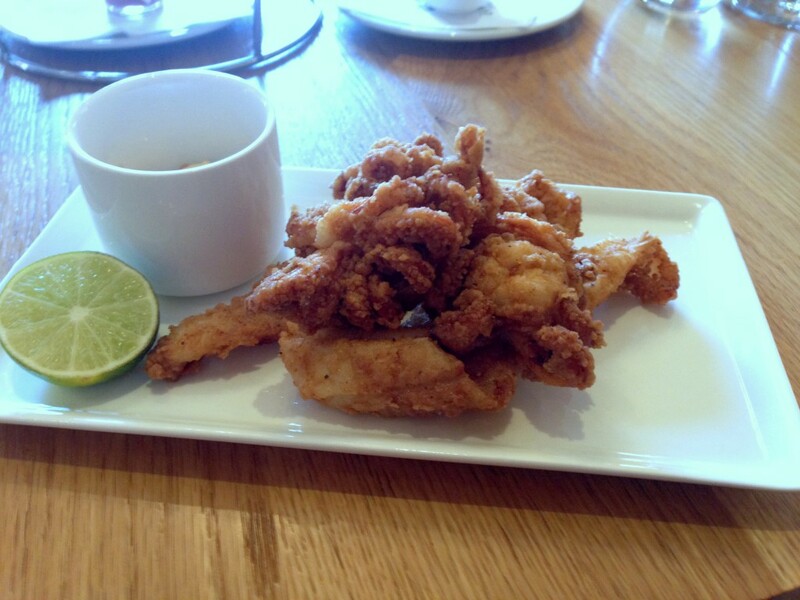 But the far better starter was the buttermilk squid with a spiced mayonnaise. The buttermilk crumb was a smidgen over seasoned, but was otherwise excellent. The squid was really tender and the mayonnaise was a good match for the squid. 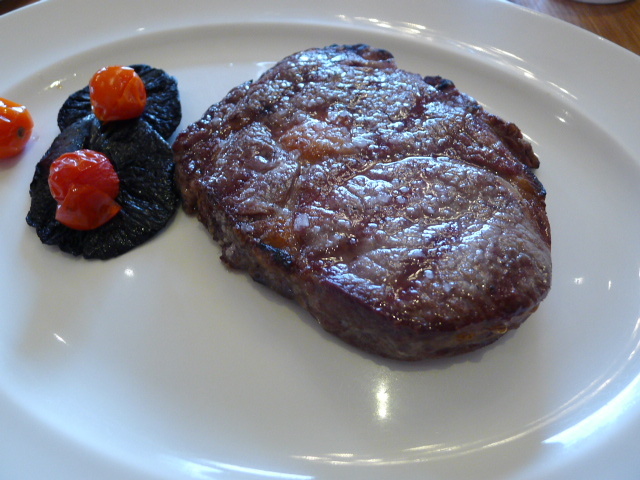 A serving of rib-eye (£27) unfortunately arrived at our table well done. We had ordered medium rare but Gillray’s quickly replaced this with a second piece which was perfect. The steak was tender and tasty, and the sauce that we chose to go with it, the red wine and bone marrow jus, boasted of a good flavour and richness. However it could have done with a little more reduction. We also went for some triple cooked chips (£3.50). They weren’t bad but should have been far crunchier for chips that go through three cycles of cooking. 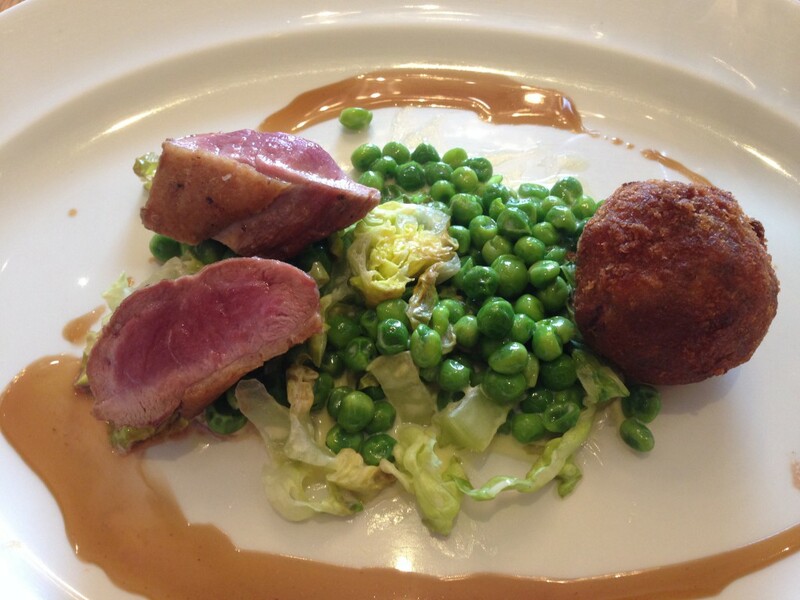 Pan-fried Barbary duck breast was perfectly cooked and paired with a moreish slow-cooked leg fritter. Accompaniments included some nicely charred onion and a pleasant London Honey jus. Also on the plate were some creamed peas that were tasty but a little over cooked. 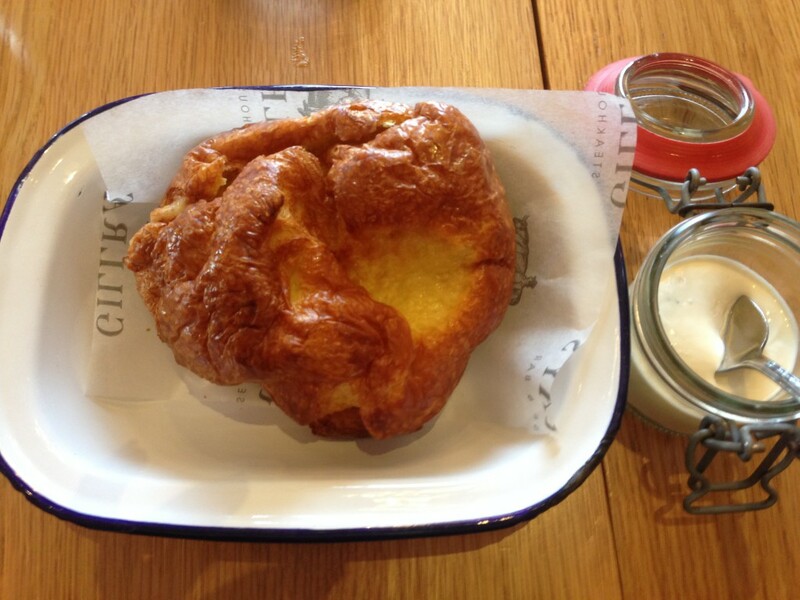 But the highlight of the meal was surprisingly the Montgomery cheddar cheese Yorkshire pudding served with a horseradish cream. Gillray’s serves the Yorkshire in place of bread and this was truly delicious, especially with the yummy melted warmth of the cheese at its centre. The batter was also excellent with a light springy texture. To desserts, and a traditional sherry trifle containing layers of sponge cake, red berries, custard and freshly whipped cream (£8) proved to be a decadent treat. 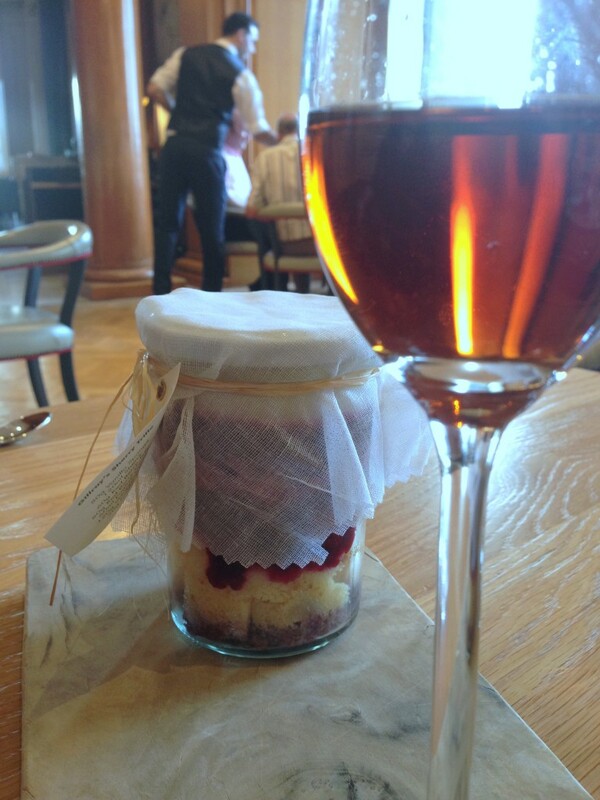 To eat this dessert you start by unwrapping and opening the jar of trifle, digging a hole through the thick cream and pouring a glass of Sherry into the jar to soak into the sponge cake at the bottom. It was really good and pretty boozy. 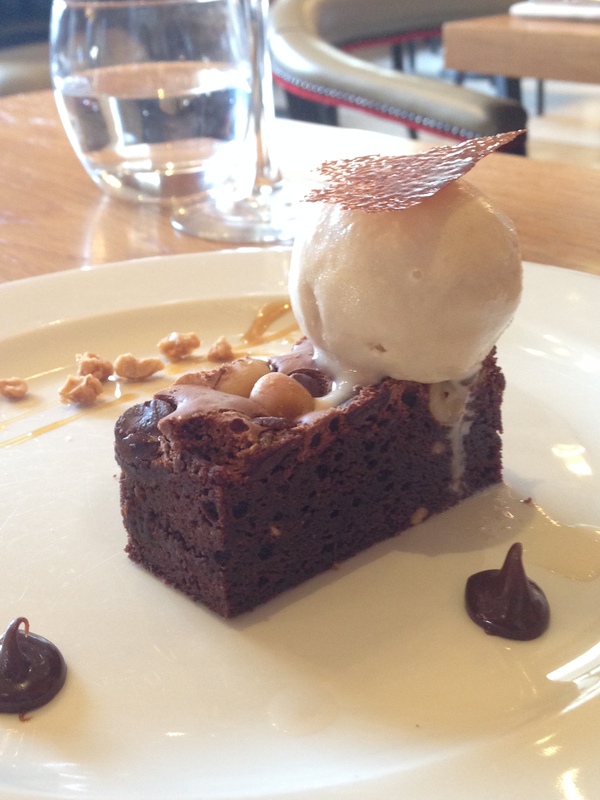 The dessert from the Autumn Market Menu was a peanut butter and chocolate brownie, roasted peanut ice cream and salted caramel. The brownie was well made and moist and there was a good saltiness to the caramel. 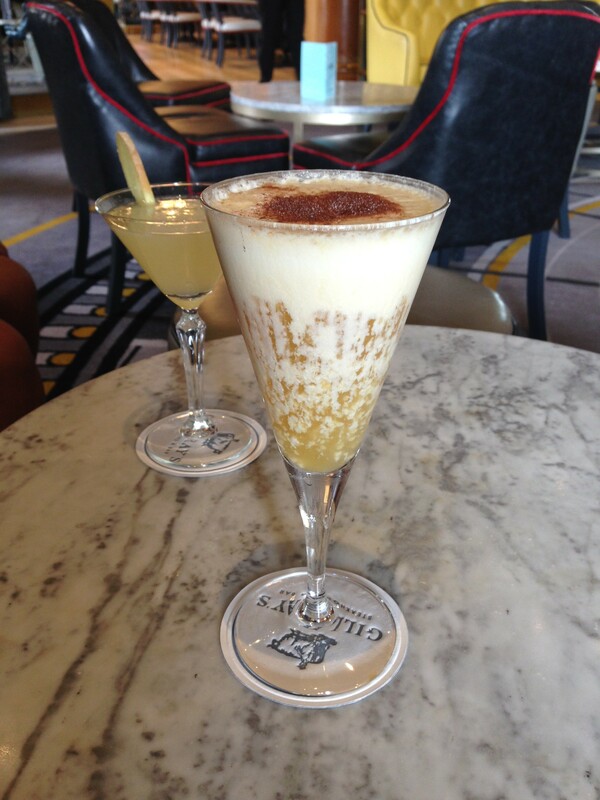 We enjoyed our meal at Gillray’s which began with the wonderful pina colada cocktail and was boasted in no small part by the amazing views. The service was splendid and we enjoyed the well-rounded cooking. Particular highlights included the Yorkshire pudding and the trifle, both of which are not to be missed. The Autumn Market Menu also offers great value. 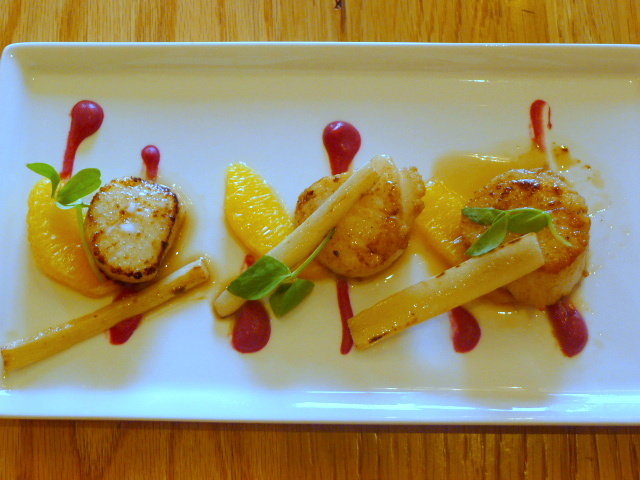 £28 to £62 for three courses from the a la carte menu. £20 for two courses and £29 for three courses from the Autumn Market Menu.